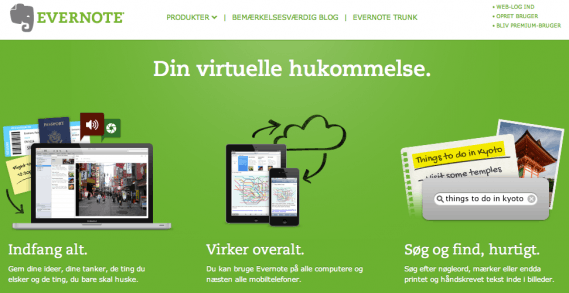 Evernote is a free tool for taking notes and for documentation, that works across many different platforms. The tool is free to use, and requires only that one creates an account. Evernote is suitable primarily for use within the dialogical form of teaching. Within the dialogical form of teaching it is obvious to let students use Evernote as an individual note tool. The fact, that the tool works across platforms, for example, students can obtain information to make and maintain their experiences using a smartphone (iOS or Android) when they are out on the field trip, and then elaborate on their experiences afterwards on a laptop in class. It is possible to save images and sound recordings produced with a smartphone in the notes, providing good opportunities to maintain experiences for subsequent processing. There is a possibility of recognition of the ' ink ' (written on smartphone or tablet), and it is possible to transform speech to text. Additionally, it is possible to create different kinds of lists in Evernote, including a 'check-list', which can be used in students' organization of their individual tasks. If you need help getting started with Evernote in Education, you can watch this guide.